I haven’t had a persimmon for years since moving to the U.S. I’ve seen them occasionally in stores, but it somehow felt different, like the spot for persimmons is forever reserved on my family’s balcony back home. I couldn’t just walk into a store and buy one or two of them without the big box and everybody around to eat it — to me it felt meant to be shared. Last week, I finally had a realization: I could use it in something savory! If it’s not a fruit for dessert, it’s a different thing all together! Adding persimmon to my curried squash soup was the best idea of this winter. Period. It’s just so good. 1. Heat up oil in a pot, add onion, garlic, ginger, and chipotle flakes. Cook and stir for 2-3 mins. 2. Add squash and persimmon and about 2 cups of water just to cover the contents. Cover with a lid and cook for about 12-15 mins until squash is soft. 3. Open the lid, stir in coconut milk, curry powder and salt. Cook for 5 more minutes, turn the heat off and let stand to slightly cool. 4. Use a blender to liquify until smooth. 5. 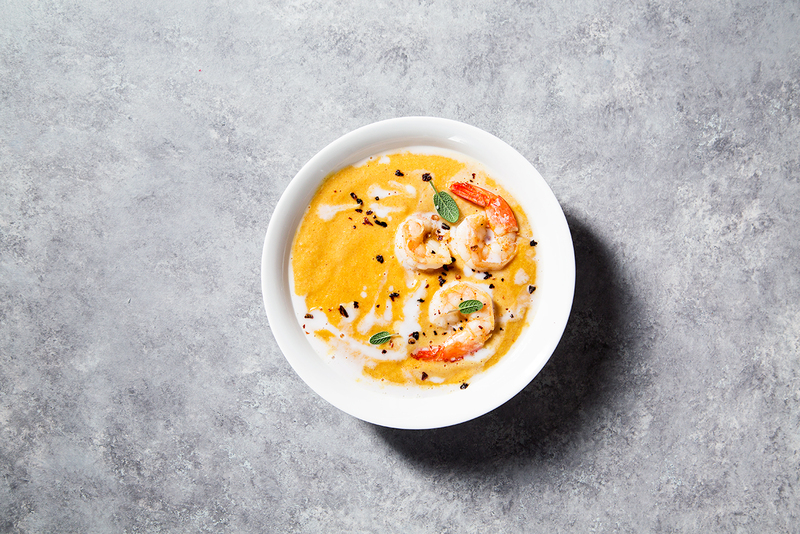 Serve hot topped with shrimp, chipotle flakes, herbs and drizzled with coconut milk. Enjoy!